Do I own a Domain name? - Sorry, but the answer is technically no, what you have is a "usage right" of the domain for a contracted period of time, usually 2-years subject to purchase and availablity. All .UK 1st and 2nd level domains are issued via Nominet.uk, who are the UK naming authority. Who or What is Nominet? - Nominet.uk is the UK Domain Name Registry. Founded on 14th May 1996. The body is responsible for the administration of 1st level and 2nd level Domains ending in .uk. It is a non-profit organisation, limited by guarantee. It is recognised by the UK government as the official registrar of the .UK family of domains. How do I buy a Domain? - Easy really, but first we have to make sure that "your" chosen name for a domain is available. (click here) If your name is "unusal" there is more chance of being able to obtain a domain name for you, but if it&apos;s a "generic" name, chances are its already been taken. Once you have decided on a preffered "name" that is also available, the process of securing the Domain name takes literally 10 to 20 minutes. Full administration of the Domain takes about 1-2 hours to complete. Assigning the Domain to your web host, is an additional service we can also provide. What Costs are involved? - As a UK registrant for Nominet.uk we cannot provide Domains for Free. "There is no such things as a free domain." We prefer to be realistic and charge a Professional Fee for undertaking both the Admin and on-going Domain Management on a bi-yearly basis. The Costs of a Domains are set by Nominet. As a Registration Agent, for Nominet, we charge a Professional Fee for organising the purchase of .UK Domains for you. We have a Free domain, why do you charge? - As explained above "As there is no such things as a free domain." FREE Domains, are a loss leader for many domains name companys, who then charge premium rates for all associated services - i.e. Web hosting, e-mail accounts etc. We see "Domains" as a primary product, that requires the fullest attention of detail to maximise your companys Profile and above all Brand. Now does that explain why we make a Professional charge for our services... Did you really want a free domain? My exisitng Domain expired, what can I do? - Was it a Free domain? - As part of our on-going Domain Management service to clients, we automatically re-register ALL Domains 14-days before its expiry date, this way we fully insure a full continuation of your web services, alongside avoiding any issues with you lossing your "valuable" Domain. If you need to cancel your Domain, we will need your clear confirmation/ instruction 28-days prior to the Domains expiry date. I already own a Domain? - If you already "own" a Domain, we can incorporate it into our Domain Management Service, via iniating a Tag Holder Transfer This then allows us to manage your Domains on a daily basis, further ensuring it&apos;s future security. What&apos;s a Tag Holder? - As a Nominet Accredited Channel Partner we are authorised by Nominet to act as "their" Registration Agent, previously know as a Tag Holder. Our Nominet Tag is: COM-MA which we have traded under since becoming a Nominet Member in 1997. I have a Domain dispute, or a complaint, what can I do? - This happens, generally when a company decides to move Domains to "another" web design company, or have just forgotten to pay a third-parties fees. Generally a "common-sense" approach resolves all issues regarding the "on-going use" of a Domain. This is something we offer via our Domain Management service. But subject to the grounds of the "dispute" or "complaint" there may be the need to further escallate this to Nominet&apos;s Dispute Resolution Service (DRS). Generally, we attempt to respond and find a resolve to your complaints or dispute within 5 working days from your initial contact. Nominet Transfer Fee: £10 +VAT. Our Adminstaration Fee: £25 +VAT, for the 1st Domain, with additional Domains charged at £10 +VAT. Transfer of Domains, take approximatly 1-2 hours subject to all conditions being meet. 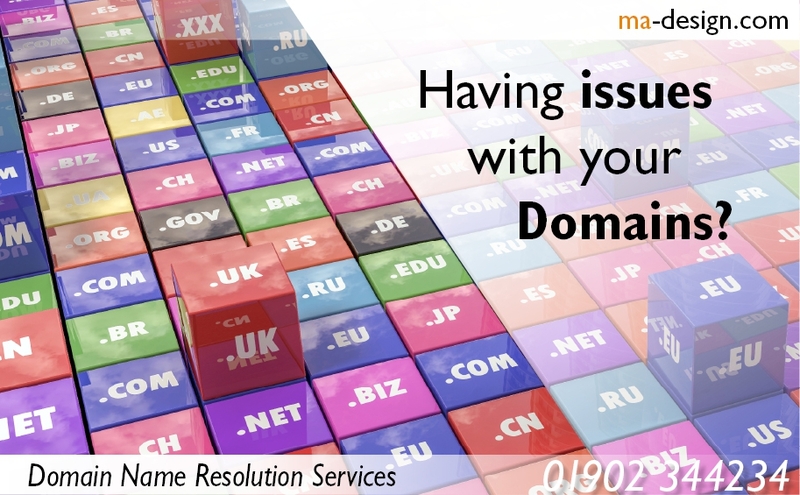 If you have any further questions about .UK Domains, please feel free to contact us: 01902 344234.
ma-design.com We maximise your companys potential, by minimising the risks., Based in the West Midlands, since 1987. With over 32-years of marketing excellence. Abstract: ma-design | We maximise your companys potential, by minimising the risks., Based in the Black County, since 1987. We look forward to speaking with you very soon. Our commitement to providing a focused Design Management service for our clients is backed by our 32 years working within a wide range of industries and market sectors, including: Electrical Contractors, Automotive, and Property Management. As being involved with both web design and hosting since 1996, we specialise in providing Web Site and Data Hosting solutions to meet exacting business needs for both access and security, from: SEO Optimisation, Web Site management, to Data Management. We are so keen to keep abreast of both new technology and marketing processes that can benefit both the packaging industry and end-users directly. In view of this we strongly believe in collaborating and sharing information with other members of key Industrial Associations within the Charitable Trusts, Engineering, Electrical Contractors, Public Relations, and Insurance industrial sectors. We aim to please our customers doing our best to provide you with a quality experience, whether you are looking for; Web Site Design, or want Vehicle Signwriting services. We will always be pleased to talk with you about Domian Name Management, Printing, or Print Management needs.